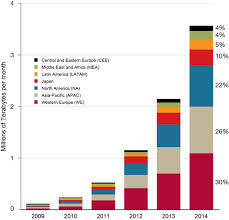 “India is recording mobile broadband data growth figures higher than most other markets. With the recent spectrum auctions paving the way for acceleration of mobile broadband penetration in the country, there is a great opportunity for India to create a world-class infrastructure and improve the lives of millions of Indians. This can be achieved through a wider 3G rollout as well as through selected introduction of LTE technologies and the modernization of existing GSM networks,” said Sandeep Girotra, Head of India Region, NSN. NSN’s MBit Index also shows that 3G users continue to consume more data on an average than 2G users. In December 2013, a 3G user consumed 532 megabyte of data compared to 146 megabyte consumption over 2G. In some of the major urban centres, the average data consumption per user is as high as one gigabyte per month, indicating the rising popularity and uptake of 3G across India. In addition, premium tariff reductions in 3G services in early 2013 led to an increased migration of high-end 2G customers to 3G.